In the previous post I highlighted some of my favorite presentations from this year’s iMoot, a web based international conference dedicated to Moodle, an open-source learning management system. The 4 day event ran 24 hours a day to accommodate all time zones and was packed with 50+ speakers across 6 continents. So, how does it feel to attend such event purely online? First of all, I would like to thank and applaud the iMoot organizers for putting together such an amazing event. Julian Ridden and his team worked hard day and night to make sure everything was running smoothly and everyone had the necessary support. And if you’re wondering what it takes to orchestrate such an event, just take a look at Julian’s ”iMoot Control Room”. The program was well planned and ran simultaneously in two tracks. There was just enough time to catch a little break between sessions, plenty of opportunities to interact with the presenters, and the repeat sessions made it possible to attend almost every session I was interested in in person. By the way - all repeat sessions were done live, not with recordings of the previous session! And in case you missed the repeat, you still have the chance to watch the recording on the conference website, usually posted within the day after the session. 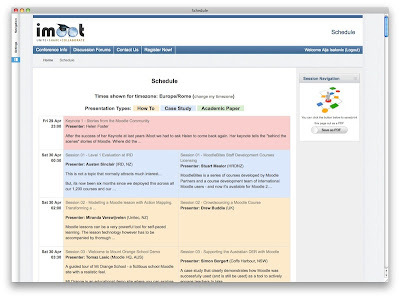 I also got a lot of opportunities to practice Moodle 2.0 on the conference site, and the organizers did a great job at providing a dynamic conference schedule (custom coded by Shane Elliott). 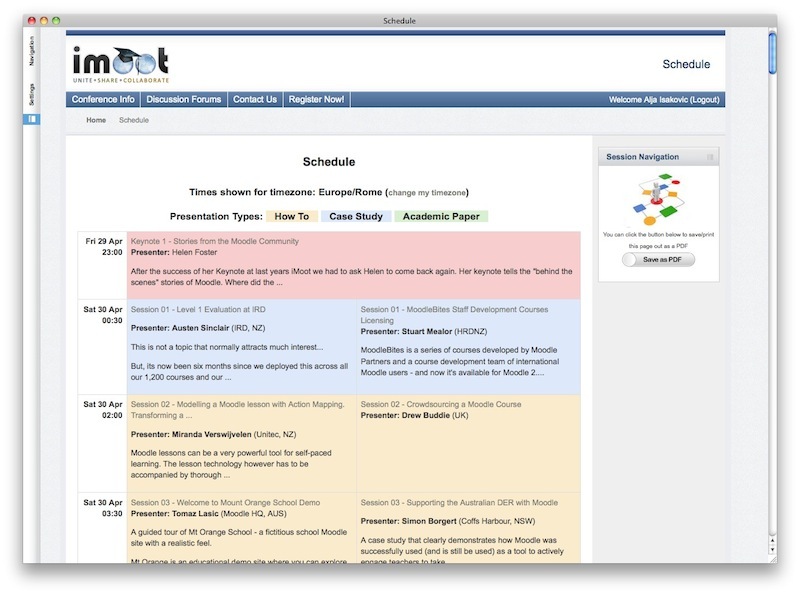 The schedule showed your local time for all sessions and made switching between sessions a breeze. You could even save it and print it as a PDF file in case you wanted to have it on paper. I must say it was a bit confusing to have a separate course for each session, particularly because each session had its own discussion forum in its own course, so there wasn’t much discussion going on on these individual forums - after all, it is difficult to follow forums in over 60 courses. It must be said that some presenters did a great job at adding extra resources to their courses and even used them for demos during presentations. 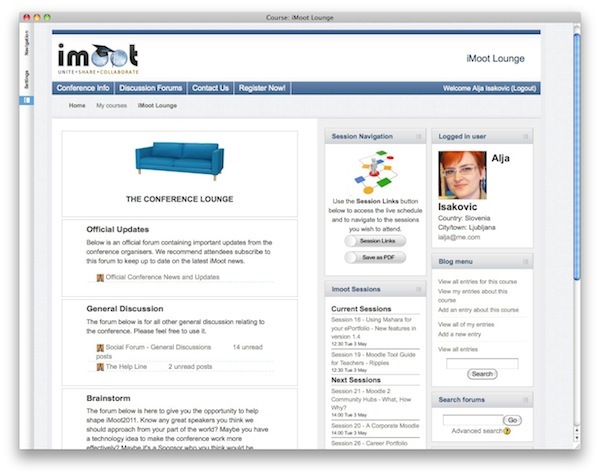 So, the main place for asynchronous discussions was the iMoot Lounge, though most discussions were related to the technical issues and questions/comments about the program. That’s why I think it might be perhaps a good idea to have session discussion all in one place, perhaps right in the Lounge, so we’d all be exposed to more content oriented discussions. But of course, as with face-to-face conferences, most of the interaction took place during the live sessions. 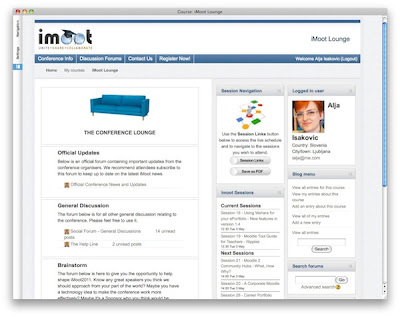 All presentations, panels and keynotes were delivered through Adobe Connect, a professional web conferencing solution, which is relatively easy to use and set up (note: I have used the system before in different roles, so I came prepared). Yes, there were some technical problems along the way, particularly in sessions with over 40 participants, when we’d all get occasionally kicked from the session room. It kinda reminded me of Second Life events with sims crashing and all (good old times!). But hey, it really wouldn’t be a real web conference without tech problems, would it? Plus, the support staff was very helpful and fast in solving any issues, so for the most part the technology did work as it should have and the sessions were easy to follow. I especially enjoyed the lively backchat during presentations that was usually both informative and fun, and provided a great opportunity to learn from one another. Big kudos also to all presenters that really engaged their audience in the presentation and did a great job at keeping an eye on the live Chat while presenting. I really feel we had more opportunities to ask questions and steer the direction of the presentation than we would in a face to face conference. So, regardless of whether you’re a Moodle pro or a Moodle beginning still exploring what Moodle can do, I strongly recommend attending an (i)Moot. 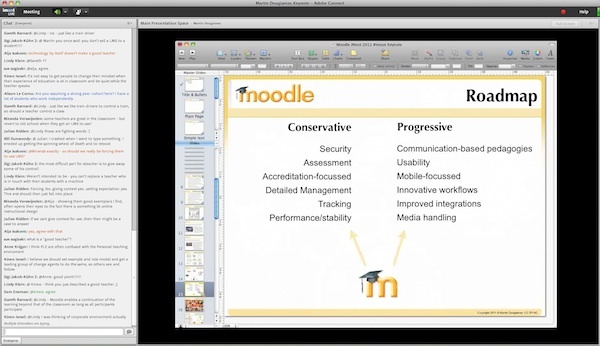 It’s a great experience and wonderful opportunity to connect with Moodlers around the world, get direct feedback and insight from core Moodle developers, and learn tons of practical tips and tricks. Also, way more affordable than attending Moodle Moots around the world, though that’s of course also a great experience if you can afford it.